Description: Beautiful 1.5 story brick home located on a corner lot. Maintenance free (trex) covered deck overlooking disappearing stream and paved stone patio. Hardwood floors throughout recently refinished. 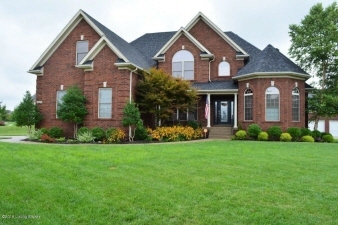 Basement highlighted with ky themed mural, brick archways, full kitchen and theater room. Large corner lot, landscaping and irrigation system. Underground dog fence. All bedrooms are spacious, master bedroom has sitting area, large master bath with his and her vanities, separate shower and whirlpool tub. Three car garage with access to basement from garage. Data believed correct but not guaranteed. Buyer to verify data prior to offer. Agents read agent remarks.